When you are in the Algarve, you don’t want to miss Praia da Rocha. Check out the video below to find out why. 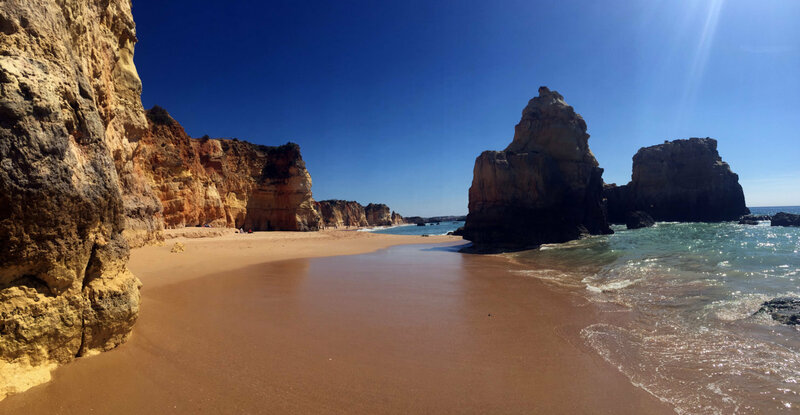 The main attraction of Praia da Rocha are the spectacular rock formations surrounding the beach. These impressive red-coloured cliffs give the beach a fascinating feel. 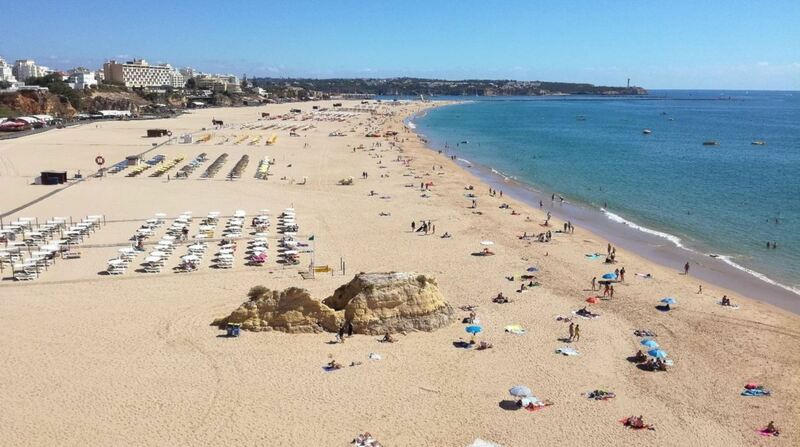 Literally, the name Praia da Rocha means ‘Rocky Beach‘. The water here is very clear. 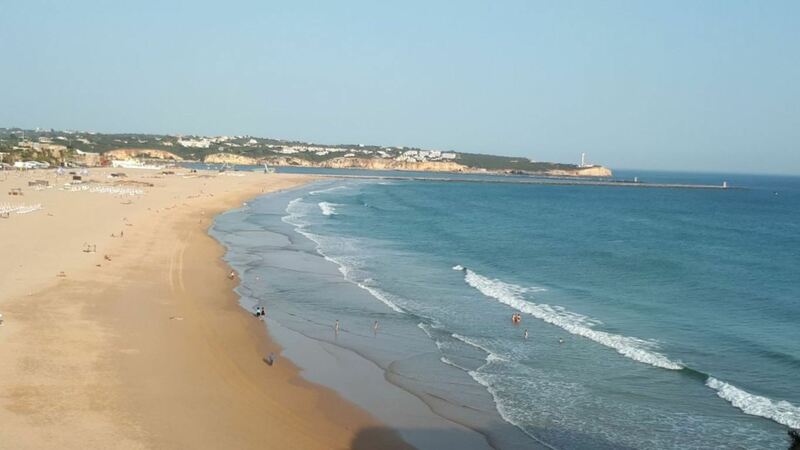 In contrast to what some people think, there are no rocks in the water of Praia da Rocha. However, the next beach (on the west), Praia dos Três Castelos, has many rocks in the water. Swimming around Praia da Rocha can be a nice experience, but the water of the Atlantic Ocean can be a bit cold. In the summer this is very refreshing though. There can be good waves here. Also, there are many water sports available on Praia da Rocha, including surfing, jet skiing, parasailing and kayaking. 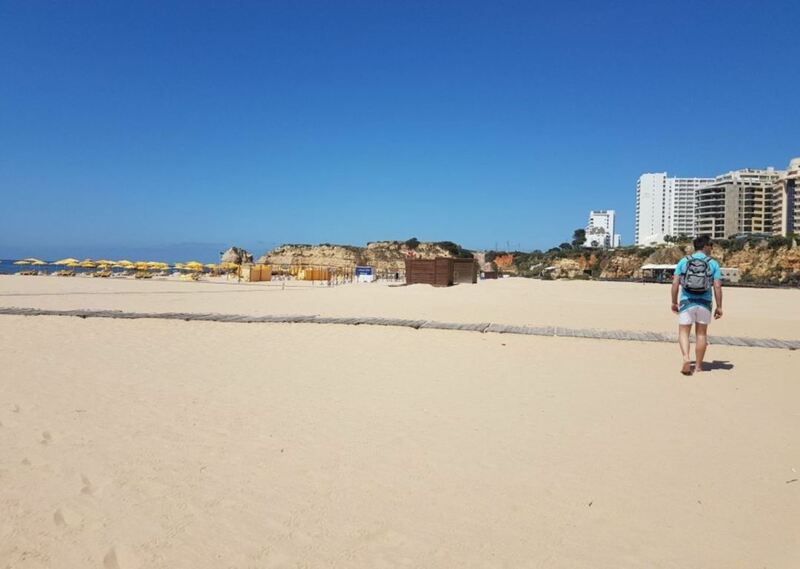 Praia da Rocha is quite a big beach: it stretches for more than a kilometre. It is both long and wide. The east side of the beach is located near the marina and the estuary of the Arade river. The beach stretches all the way to the rock formations in the west, which separate Praia da Rocha from Praia dos Três Castelos. Do not sit too close to the rock formations, as there is the danger of rockfall. 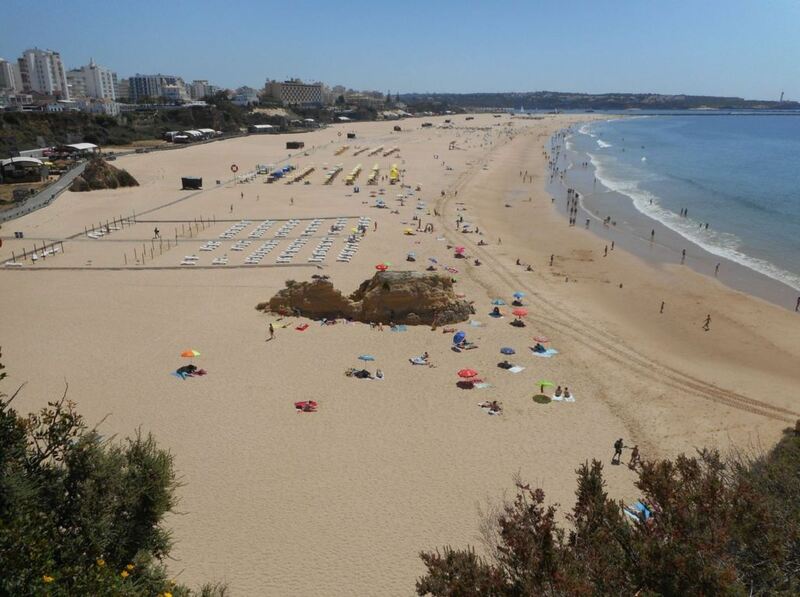 Praia da Rocha is a very popular beach. It attracts many people, especially in the summer and during weekends. You can find many tourists and Portuguese families here. The beach also attracts a lot of younger tourists, who like to party at night. Thus it can be very crowded on the beach. The busiest parts of the beach are usually the middle section and the western end (on the right side). 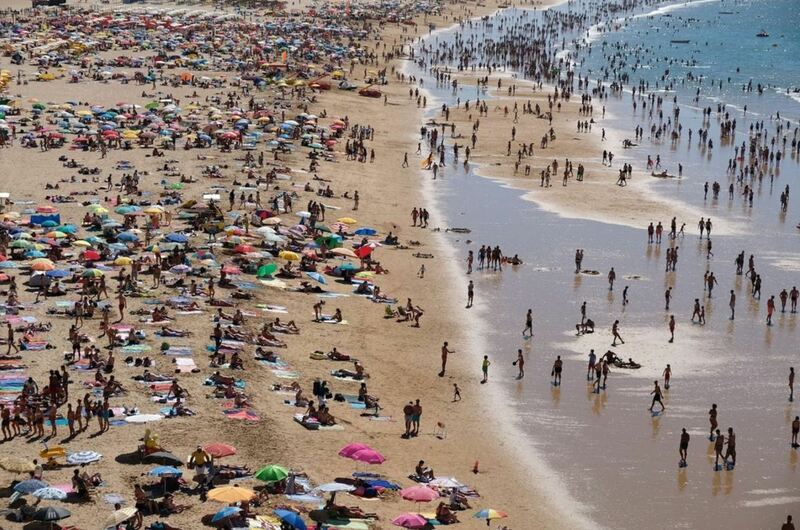 However, Praia da Rocha is very big and there is plenty of space for everyone. You will always be able to find a spot. In the winter, the beach attracts a more mature crowd, who go there for beach walks and fine dining. Along the boardwalk you can find several beach bars and restaurants. Here you can have lunch or grab a refreshing drink. Also, these places have toilets available. While there are several bars and restaurants on the beach, our favourite place is Spot3. The vibe is relaxed and the food is great. Make sure to try their açai bowls. The area around Praia da Rocha is famous for its nightlife. Together with Albufeira, Praia da Rocha is one of the best places to party in the Algarve. 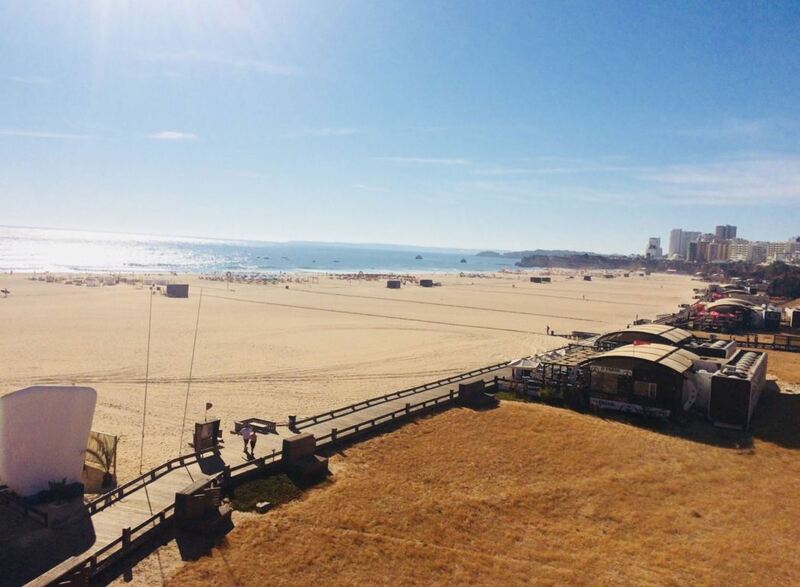 The combination of party and huge beach makes Praia da Rocha one of the best-known beaches of Portugal. 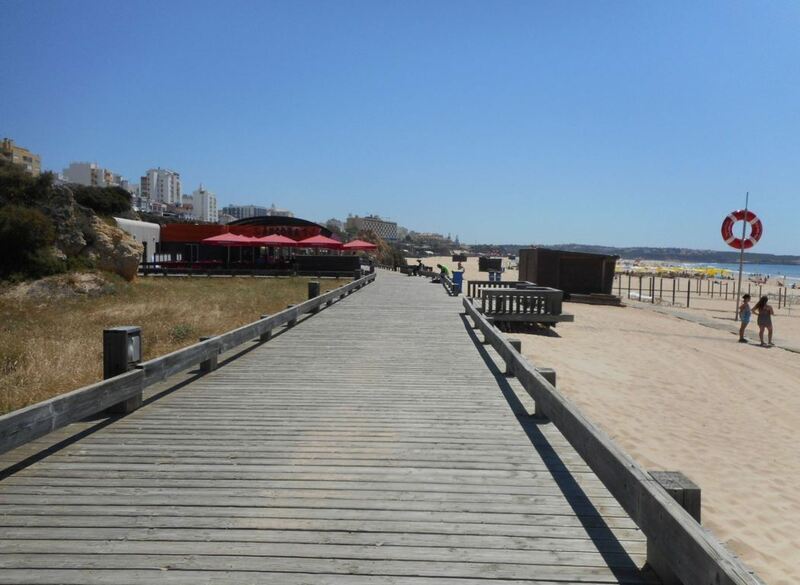 The boulevard behind the beach, Avenida Tomás Cabreira, has many restaurants, bars, hotels, shops and clubs. It is quite touristic. You will find many people here in the evening, especially in the summer. There are several Irish pubs and English bars as well. Furthermore, there is a casino on this street, which offers entertainment every night of the week during summer. A famous nightclub on Avenida Tomás Cabreira is Katedral. Another great party place is NoSoloÁgua Club. This classy beachclub is one of the most upscale party places in Portimão. Include a short visit to the Santa Catarina fortress (Forte de Santa Catarina). This fortress is located up on the cliffs on the eastern section of the beach (on the left side). The fort was built in 1621. 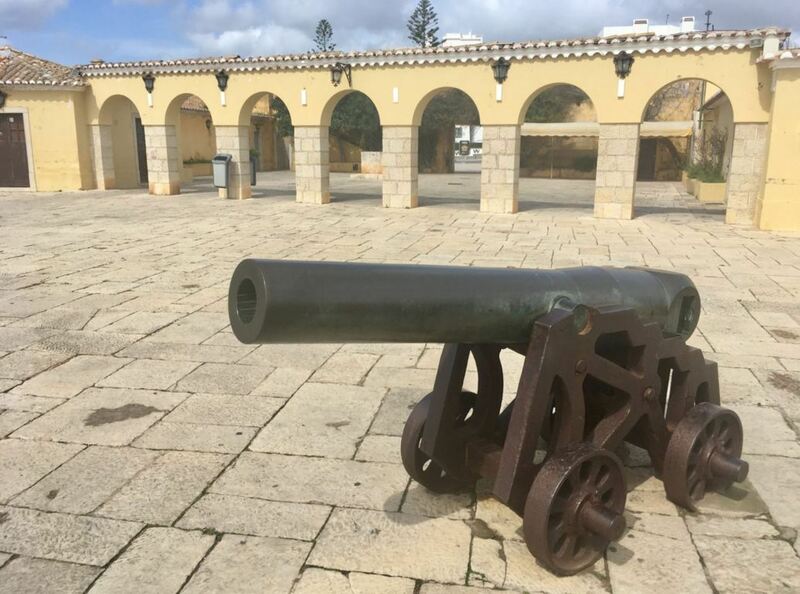 Back in the days, the fortress defended Portimão and the estuary of the river from Spanish pirates and Moors. The fortress can be reached by a staircase in the cliffs. The fortress itself is quite small, but offers impressive views over the beach and its surroundings. Unfortunately, there is no audio guide or exhibition about its history. The fortress also has a viewpoint over Praia da Rocha. Another viewpoint that offers magnificent sights is the Três Castelos viewpoint. This viewpoint separates Praia da Rocha from Praia dos Três Castelos. Praia da Rocha is also popular for sports. From 2005 to 2012, the annual beach soccer tournament Mundialito took place on Praia da Rocha. Also you will find beach volleybal competitions here. The following video about beach volleybal on Praia da Rocha, shows you the chill vibe of the beach. The video also contains some amazing shots of the beach itself. 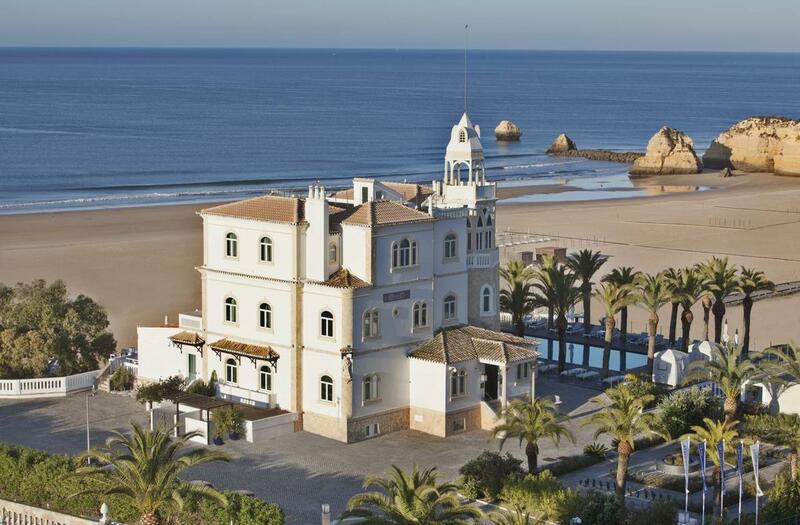 Back in the 1930s, Praia da Rocha became one of the first resorts in the Algarve. By then, it consisted of rich villas and was an elegant resort for rich Portuguese families. Some of these villas still can be seen on the cliffs above the beach. 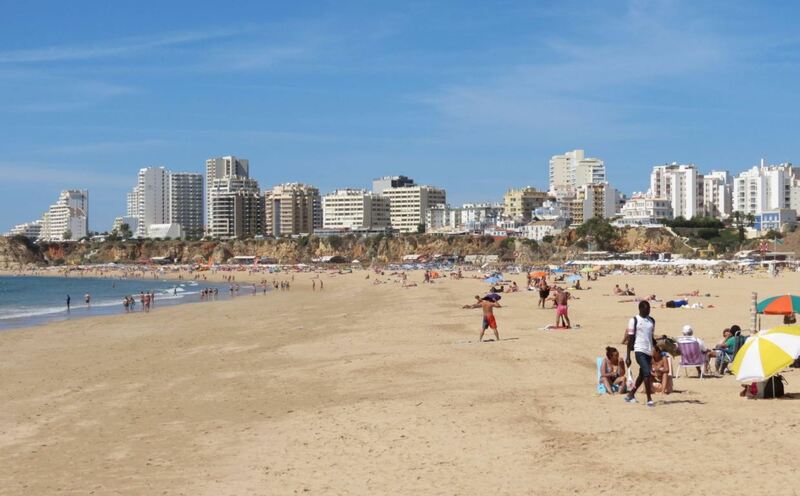 The big development of Praia da Rocha as a mass tourism destination began in the 1970s and 1980s. Nowadays, you can see many apartment blocks and hotels in the area. Not everyone in Portimão is happy with the current skyline of the beach. 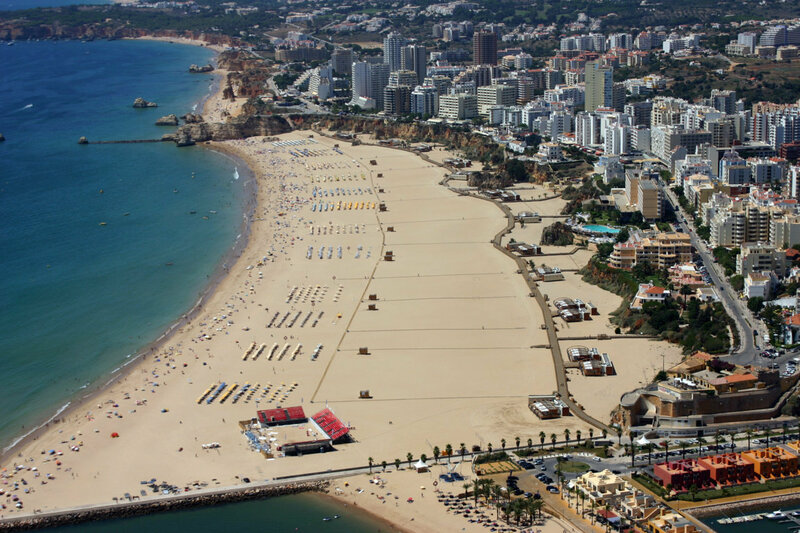 Praia da Rocha is located 2 km south of the city of Portimão. When you are in Portimão, you will see many signs indicating Praia da Rocha. Alternatively, you can enter the following address in your GPS: Avenida Tomás Cabreira, Portimão. You have to be lucky to find a parking spot near the beach. If you can’t find a parking spot, park your car a bit further and walk to the beach. There is a new outside parking area built near the roudabout of estrada da rocha. This parking area is free and almost always has space, even in the height of summer. 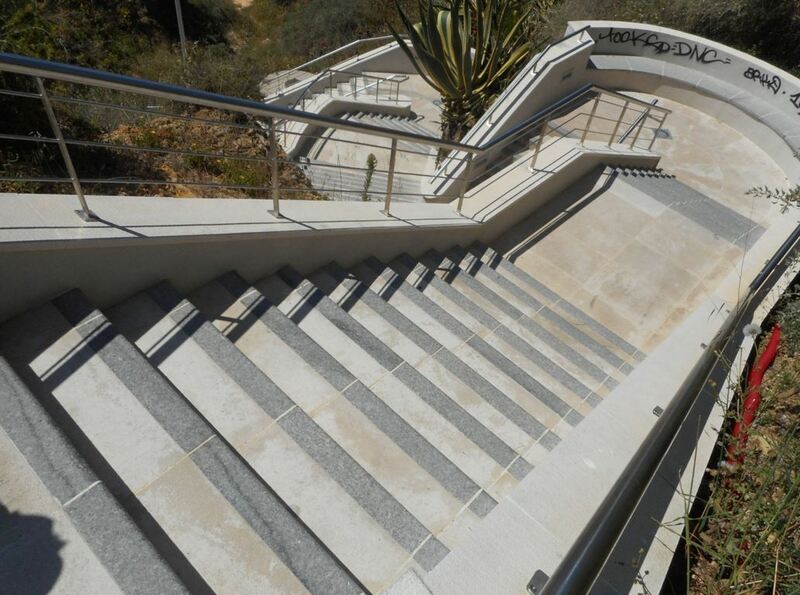 From Avenida Tomás Cabreira, there are several stairs down to the beach. Jupiter Algarve Hotel. 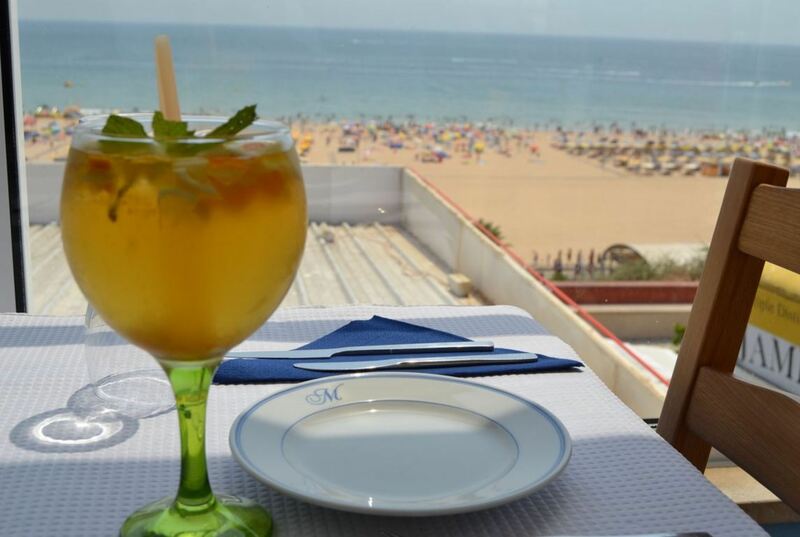 This hotel is located right on avenida Tomás Cabreira, the boulevard behind Praia da Rocha. It has a swimming pool, spa facilities and live entertainment every night. This hotel was renovated not too long ago. Highly rated. Bela Vista Hotel & Spa. 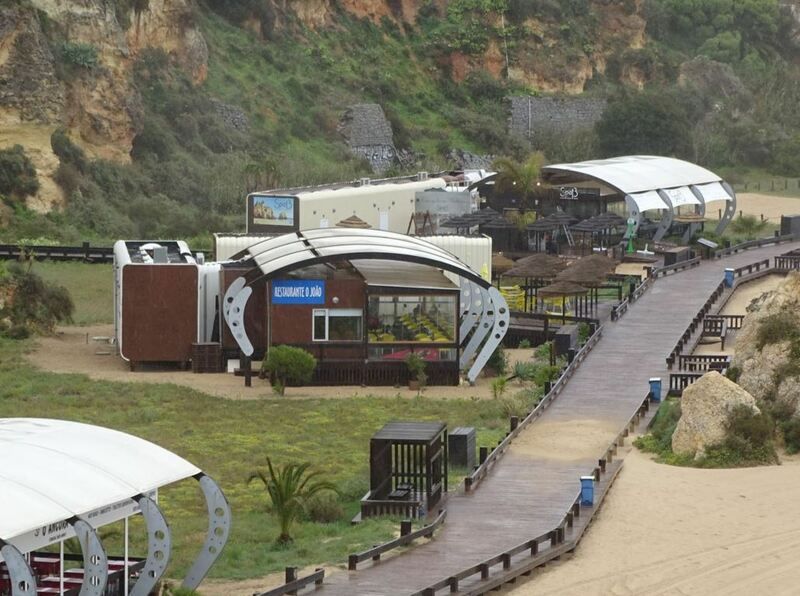 This five star hotel is located right on top of the beach and was actually the first hotel of the Algarve. The Bela Vista Hotel even has a private section of the beach, just for hotel guests. This hotel is for people who like luxury and want nothing but the very best. Luxurious beachfront apartment. This apartment has barbecue facilities and its own swimming pool. Located 50 metres from the beach. 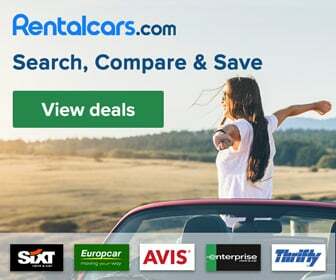 Perfect value for price and highly rated. While Portimão is great, there are many other things to see in the Algarve. Portimão is the perfect starting point to discover the rest of the region. What about exploring the castle of Silves, having fun at Zoomarine or seeing the coastline of the Algarve by boat? There are many excursions you can take and some of them can already be booked online. Below you can find our favourite excursions in the region of Portimão. 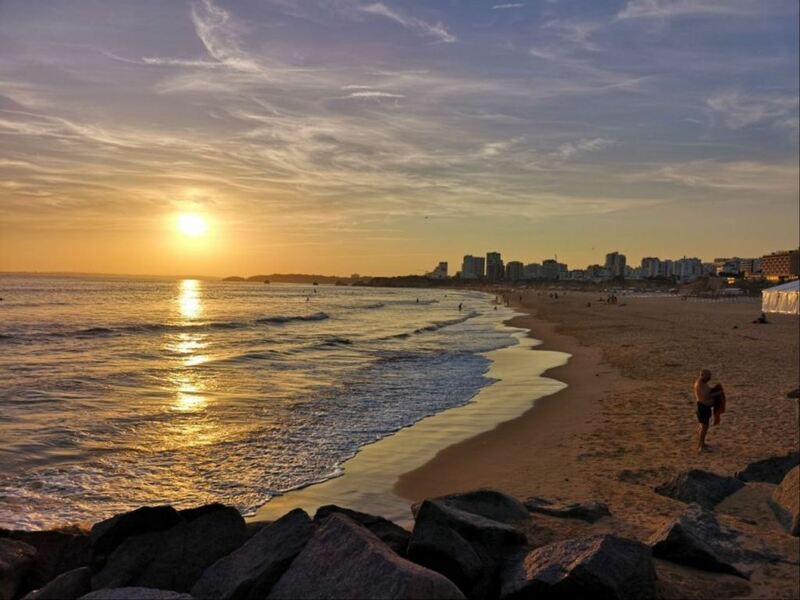 Behind the beach there is a lively boulevard (Avenida Tomás Cabreira), which is especially suitable for walking and sightseeing. Along the boulevard you will see many bars, restaurants and clubs. Near the beach you can also find a gambling casino. There are all types of water sports available, as well as many beach restaurants and other facilities, like lifeguards and sunbeds. In essence, the beach has all the facilities you could ask for.